The Aura is the electromagnetic field, the psychic field of energy surrounding all beings, human or otherwise. Its size can vary from a few inches to many feet in all directions. 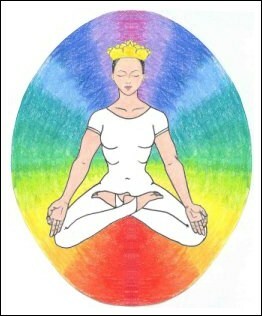 It is associated with the health of the physical body, and all the organs impact the strength and the size of the aura. It includes and is impacted by all the elements, and its colors vary and change depending upon the mental, emotional and physical states. To experience one's energetic self. Human individuation and identification with one's Soul.